Hundreds of fans descended upon London on the 25th June 2011 to celebrate 20 years of Sega’s well-known blue hedgehog, Sonic. There have been countless Sonic games, some have been excellent, whilst others have been a bit disappointing, but it appears that fans have not grown tired of Sonic after two decades. So why is Sonic so popular? Here I'm taking a retrospective look at the Sonic series, as well as news about the 20th anniversary celebrations. It all started back in 1991 on the Sega Megadrive. Sonic the Hedgehog brought gamers a fast-paced platformer, with the now familiar blue hedgehog. The first game in the series proved to be one of the Megadrive's best sellers, and thus spawned an ever-growing collection of games. Over the years, more characters have joined Sonic, such as his flying side-kick Miles "Tails" Power, Knuckles, who originally started off as a henchman to Sonic's arch-nemesis, Dr. Robotnik, Shadow the Hedgehog, and a whole host of other buddies and bad guys. The Sonic series has seen it's fair share of genre changes throughout the past 20 years. Not wanting to stick to their traditional platforming game play throughout, the Sonic Team created puzzle games, such as Dr. Robotnik's Mean Bean Machine, Sonic the Hedgehog Pinball, racing games such as Sonic Riders and Sonic & Sega All-Star Racing. 2007 signalled the first Sonic crossover game, featuring a host of Nintendo characters in the Wii and DS game Mario and Sonic at the Olympic Games. 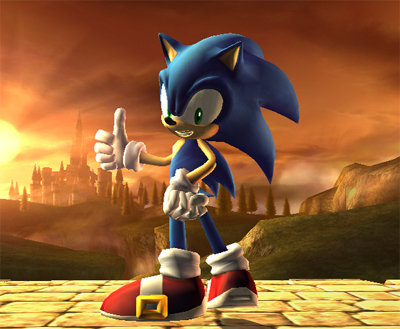 This created a partnership between Sega and Nintendo, and Sonic has since been seen in Nintendo's best selling fighting game Super Smash Bros. Brawl, as well as a few Wii exclusive titles. It is clear to see that game developers are pleased to have Sonic titles gracing their consoles, as Sonic games are present on Sega's consoles, most of Nintendo's, and the Playstation consoles. So what's next for Sonic? Well, an as-yet untitled Sonic game for the Nintendo 3DS was announced at E3. Mario and Sonic at London 2012 Olympic Games is released next year, as well as Sonic Generations, which allows gamers to play classic Sonic through new and re-imagined levels, such as the classic Green Hill Zone. A demo of Sonic Generations is available to download for 16 days from today on the Xbox 360 and PS3. 20th Anniversary merchandise will be released, including figures, plushes and comics. For a limited time only, the arcade versions of the classic Sonic games have a price reduction on the Playstation Network and Xbox Live Marketplace, some of which are up to 50% off. A Sonic Anniversary Bundle Pack is available for 20 days from the 23rd June 2011, and features Sonic 1 and 2, Sonic Adventure, Sonic 4: Episode 1 and a special Sonic theme. With so much planned for Sonic, it is clear that this blue hedgehog will not be fading into the background any time soon. Happy anniversary Sonic!